This post comes to you one day late due to a bad computer crash. In spite of having a sore bandaged thumb, Nick spent the better part of Valentine's Day getting my hardware all fixed up again, making things much faster and more powerful than they were before. I've been joking that I should have broken it sooner! 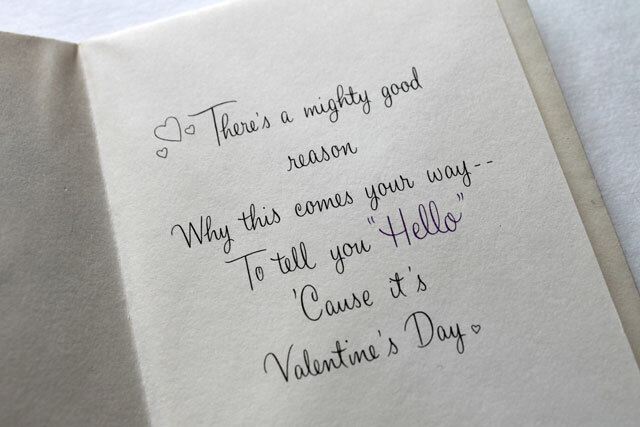 I hope you had a good Valentine's Day yesterday, no matter how you spent it. We had a nice dinner at home, which I'll post about on Monday. 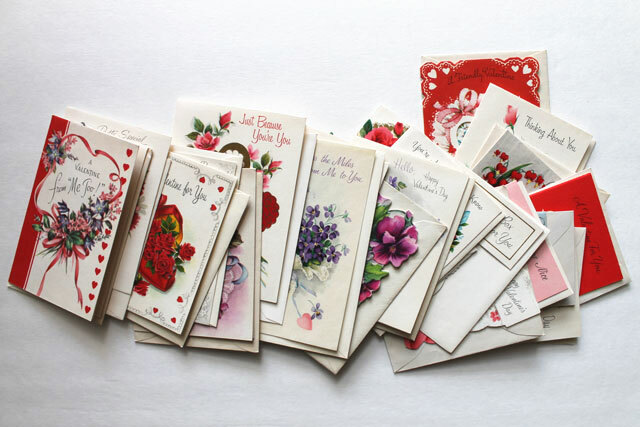 I thought you'd like to see this assortment of 21 Vintage Valentine cards that I bought as a lot on ebay a few years ago. Coming in for significantly less than any purchased new cards would, I was being frugal and my intention was to actually use them. But I still have them, so you know that didn't end up happening! 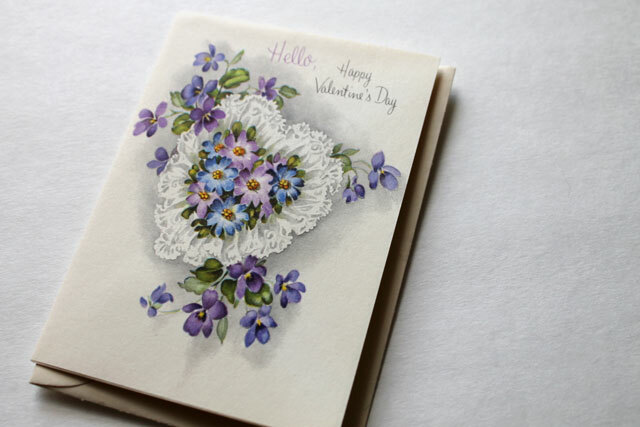 Once I saw them I just couldn't bear to part with them and thus began my collection of vintage paper things, that has now grown to include other valentines, Christmas Cards, Birthday Cards and old seals (stickers that you lick to stick). I estimate that these tiny cards, the largest of which is only 4 1/2 inches tall, date back to the late 40s - early 50s. 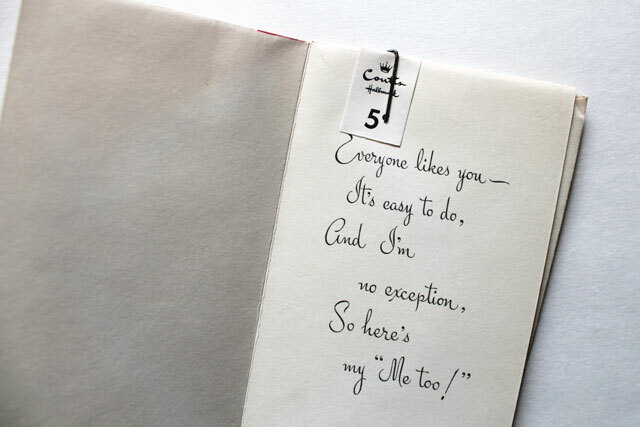 In my experience with vintage stationery, these are rare Valentines in that they were meant to be given by an adult female to her adult female friends. There is nothing overly appealing to children nor any message of romance in them at all. Rather they convey friendly affection. 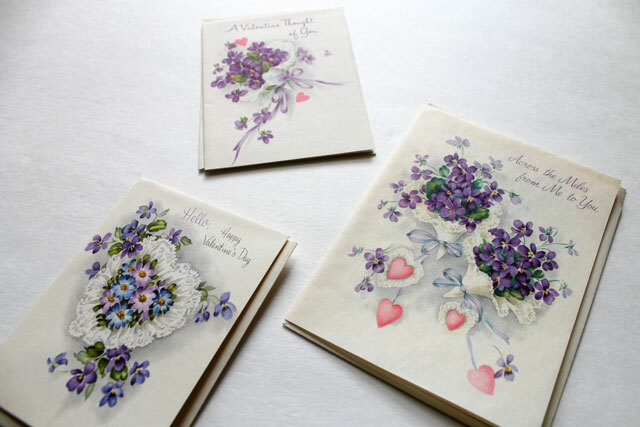 It makes me wonder when and why sending such sweet cards to girlfriends went out of fashion. 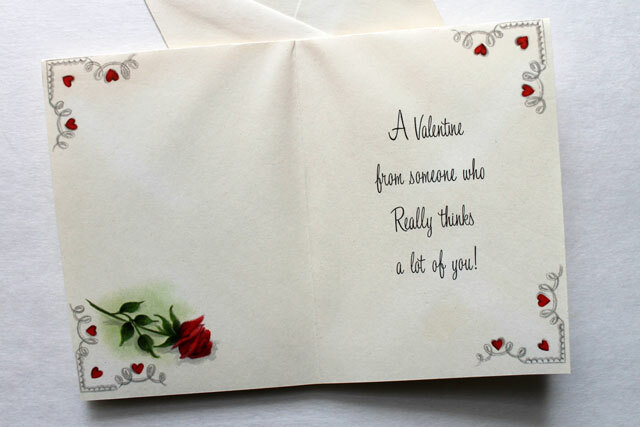 Or am I wrong ... did any of you give a valentine to a friend this year? Another thought about these mysterious cards is that they could reflect a failed attempt by the card maker (they are all Hallmark cards) to increase sales. 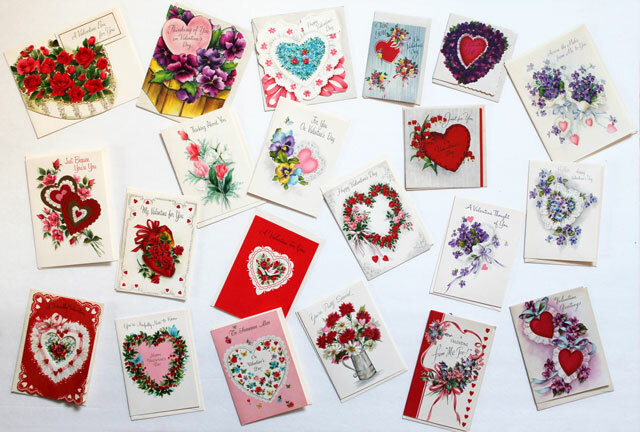 In fact, the same person who sold these Valentine's had another lot of cards up for sale on ebay the week after I bought mine. This second set was meant to be given to friends for New Years. 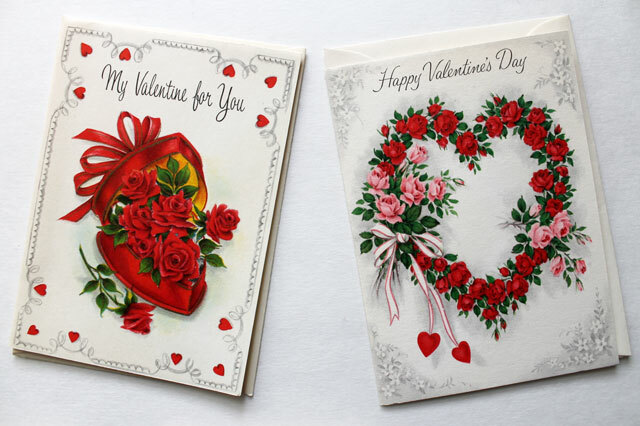 They were very similar in style to my Valentines but had Happy New Years images and messages on them. I still lament the fact that I moved too slowly to get those and they were snapped up under my nose as I sat there deliberating whether to push the 'buy it now' button or not. Those are the ones that got away and I still occasionally do a search for New Years cards as I like the idea of sending them to friends who don't celebrate Christmas, but I've never come across any more. If you're interested in seeing other rare or odd cards I have in my collection, here is a post on some I have that were meant to be given out for April Fool's Day. What?? 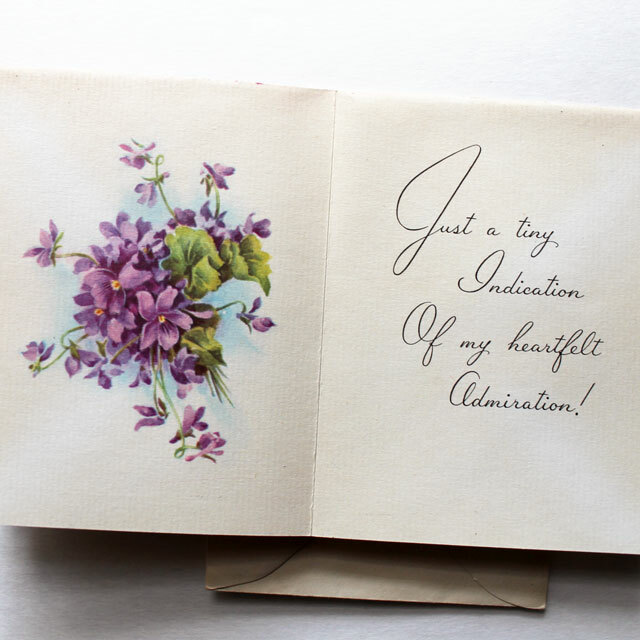 And here is an Easter Card from 1945 that looks as though it might have been and attempt at encouraging the giving out cards at Easter in the same way that children give out Valentines on February 14th. And here are some of my Christmas cards, my favourites being the complete box of turquoise cards with the little girl holding a pink Christmas tree. Anyway, I hope you found this interesting. Thanks for taking a look. What a great find! 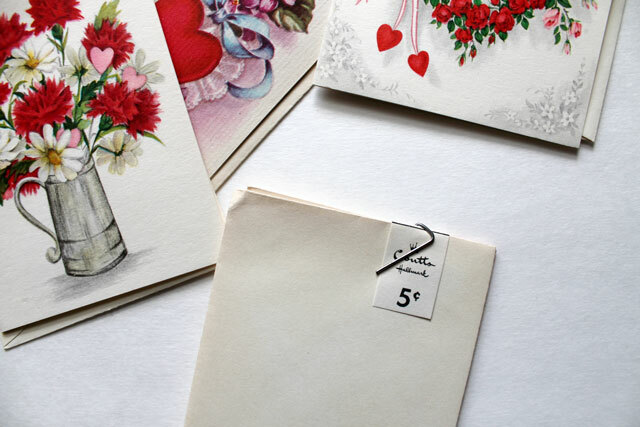 I know you love your vintage greeting cards, i can just imagine how excited you were when that package turned up. YAY your computer is fixed! 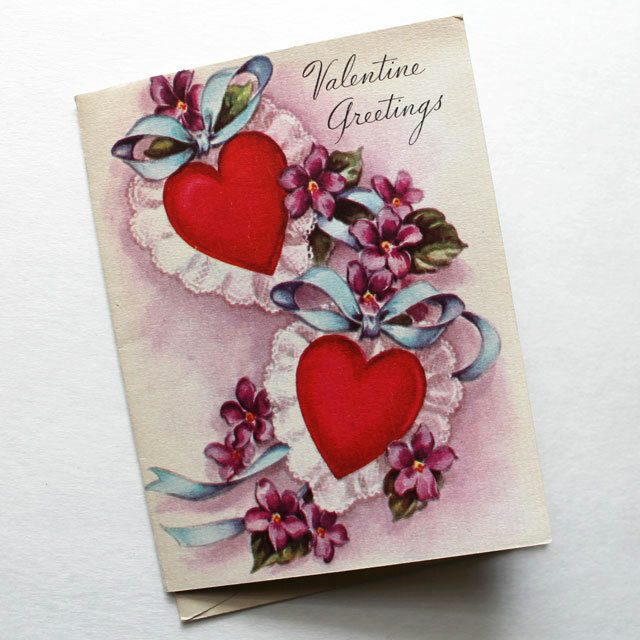 I loooove vintage Valentines cards. 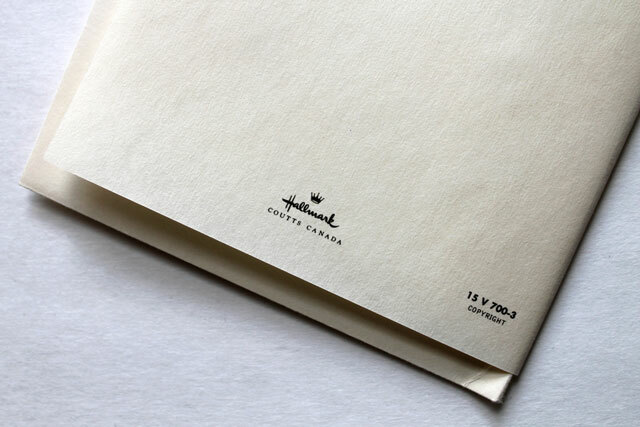 The artwork on them is always so elegant! oh wow, what a fabulous find! 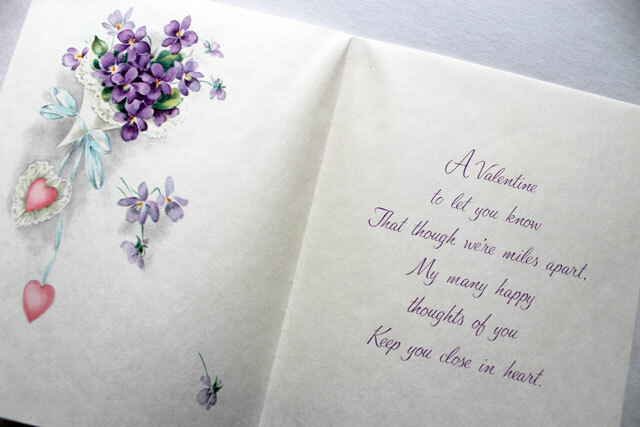 The inscriptions are lovely, they seem focused on friendship sort of valentines, which is a great idea. I would have snapped them up, too! these are so sweet, loulou! love them!